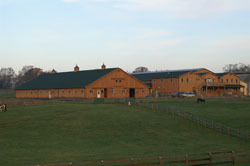 Baywood farms is located in the heart of Anne Arundel County horse country, just minutes south of Annapolis. Situated on over 50 acres of scenic rolling hills, this brand new, state of the art facility is unparalleled in amenities, services and horse care. At Baywood Farms, we are dedicated to pampering both the horse and rider. We believe in putting your horse’s care first, and providing the most complete services for our clients. While our emphasis is on providing unequaled boarding services and amenities, we also offer riding lessons in all English disciplines, focusing on Hunter / Jumper Equitation and Balance-Seat riding. Whether you are a beginner, intermediate or advanced rider, we have an instruction program to fit your needs and riding goals.